By the middle of the nineteenth century, the issue of slavery had caused a deep division between North and South. Slavery was an important part of the Southern way of life, and slave labor was a significant aspect of the Southern states' economy. Northerners opposed slavery yet were concerned that the political, economic, and ideological conflict with the South over slavery could threaten a civil war between the two sides. The conflict intensified over the issue of fugitive, or escaped, slaves. Because slaves were treated as property in the South, slave owners felt it was their right to seek out and recapture slaves who had escaped to free Northern states. Northerners tended to view this practice as kidnapping. Many wondered if officials in the free states had a duty not to interfere with the slave owner or in fact had the power to declare the slave a free person. Article 4, section 2 of the Constitution stated that slaves who escaped to free states had to be surrendered to their owners upon demand. But although the Constitution recognized the institution of slavery and the rights of slave owners, it was still unclear just what the law required of the people and officials in free states in regard to the matter of fugitive slaves. In other words, enforcement of the Constitution on this matter was a gray area decades before the Civil War. The Fugitive Slave Act of 1793 (1 Stat. 302) was an effort to provide a means to enforce the constitutional clause concerning escaped slaves. The act allowed a slave owner to seize an escaped slave, present the slave before a federal or local judge, and, upon proof of ownership, receive a certificate authorizing the slave to be retaken. It also established a penalty of 500 dollars for obstructing an owner's efforts to retake a slave, or for rescuing, harboring, or concealing a fugitive slave. Some Northerners saw the act as providing an excuse for the kidnapping of free blacks. Others resented the ability of slave owners to reclaim slaves who might have escaped many years ago and who had new lives in the North. As a result, Northern states responded to the act by passing "personal liberty" laws, which protected alleged fugitive slaves in various ways. Southerners saw these laws as objectionable efforts to get around the act and the Constitution. In 1842, in Prigg v. Pennsylvania, the Supreme Court held that Pennsylvania's personal liberty law of 1826 was unconstitutional. Edward Prigg had been convicted of kidnapping for taking a black woman and her children from Pennsylvania (a free state) to Maryland (a slave state). The Supreme Court overturned his conviction, holding that state laws could not permissibly interfere with the rights of slave owners reclaiming fugitive slaves. In 1847 the Court reaffirmed the constitutionality of the 1793 act in Jones v. Van Zandt. Opponents of slavery resented these decisions, which sparked protest, resistance, and new laws and policies making the retaking of fugitive slaves more difficult and costly. 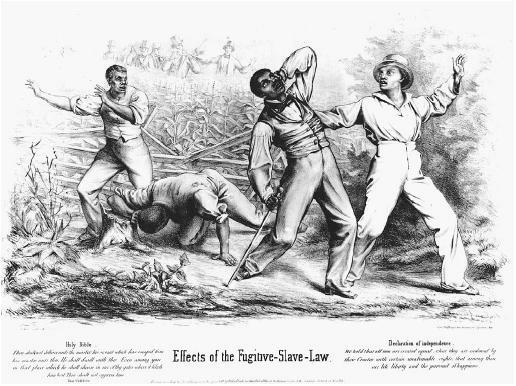 Abolitionists effectively used the 1793 act and the court decisions upholding it to call attention to the evils of slavery. Southerners grew ever angrier and pressed for legislation that would more strongly protect their right to reclaim fugitive slaves. The Fugitive Slave Act of 1850 (9 Stat. 462) was an important part of the Compromise of 1850. On one side, Southerners sought to strengthen the fugitive slave law. On the other side, Northerners sought to respect the Constitution's fugitive slave clause and thereby preserve the Union by accommodating Southern anger over the fugitive slave issue. The act represented this effort to hold the country together. • The alleged fugitive was not allowed to testify at the hearing. • Commissioners received twice as much compensation (ten dollars) for granting certificates as for denying them. • Federal marshals were financially liable for not trying to execute the warrants and for allowing fugitives to escape. • Penalties were increased for obstructing slave owners or helping fugitives, and included imprisonment. Northerners saw this act as substantially more intrusive than the act of 1793, and their reaction was swift. Many people resisted and defied the law. 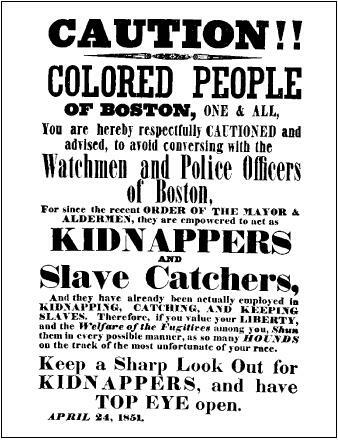 In 1851, for example, Frederick Wilkins, known as Shadrach, a fugitive slave from Virginia, was rescued from a Boston courtroom and helped to escape to Canada. In some areas it was difficult to find people willing to do the duties required of commissioners under the act. Juries ignored evidence and acquitted people accused of violating the act. In June 1851 Harriet Beecher Stowe began publishing her influential antislavery novel, Uncle Tom's Cabin, in weekly installments in the National Era magazine. Shortly afterward it was published in book form and sold widely, increasing Northerners' opposition to slavery. In 1860 South Carolina seceded from the Union, and within months other states followed suit. The Civil War began in 1861. Three years later, in 1864, the Fugitive Slave Acts were repealed. some abolitionists in the North—and even some Northern legislatures—were encouraging slaves to revolt, a possibility that many Southerners greatly feared. The Fugitive Slave Acts failed as part of an effort to hold the Union together. Instead, they highlighted differences on the issue of slavery. The acts also raised important issues about what it means to follow the rule of law and pursue justice under a Constitution that both promoted freedom and allowed slavery. See also: COMPROMISE OF 1850; KANSAS NEBRASKA ACT OF 1854; MISSOURI COMPROMISE. Cover, Robert M. Justice Accused. New Haven, CT: Yale University Press, 1975. Fehrenbacher, Don E. Slavery, Law, and Politics. New York: Oxford University Press, 1981. Finkelman, Paul. An Imperfect Union. Chapel Hill: University of North Carolina Press, 1981. Hall, Kermit L. The Law of American Slavery. New York: Garland Publishing, 1987. Wiecek, William M. The Sources of Antislavery Constitutionalism in America, 1760–1848. Ithaca, NY: Cornell University Press, 1977. Many people believe that the descendents of slaves should be compensated, or paid "reparations," for the injustices that their ancestors endured. Reparations have been paid to other groups who were treated unjustly, such as Japanese Americans interned during World War II. While some believe that reparations should be paid by the U.S. government, others have begun seeking compensation by filing lawsuits against corporations that benefited from slavery. Opponents of reparations argue that many black Americans are not descended from slaves, and that it would be difficult to establish who would be eligible for reparations. Furthermore, many white Americans are descended from people who immigrated to the United States after the Civil War, and so should not be blamed for slavery or made responsible for paying reparations. Proponents of reparations, on the other hand, argue that black Americans as a group continue to suffer from the legacy of slavery, regardless of their particular lineage. Some propose that reparations be paid into a fund that would finance education, health care, and economic opportunities for black Americans rather than be paid to individuals. Source: Major Acts of Congress, ©2004 Gale Cengage. All Rights Reserved. Full copyright. Did this raise a question for you? eNotes.com is a resource used daily by thousands of students, teachers, professors and researchers. We invite you to become a part of our community. © 2012 eNotes.com, Inc. All Rights Reserved.